Filming on the 13-part second series of BBC One fantasy series Atlantis has begun at Chepstow. Jack Donnelly (Jason), Mark Addy (Hercules), Robert Emms (Pythagoras), Sarah Parish (Pasiphae), Aiysha Hart (Ariadne) and Juliet Stevenson (The Oracle) all return. New additions joining the cast is Vincent Regan as Dion and Amy Manson as Medea. Created by Merlin writers Johnny Capps and Julian Murphy, and written by Misfits creator Howard Overman, the series features a world of legendary heroes and mythical creatures loosely based on Greek myths and legends. 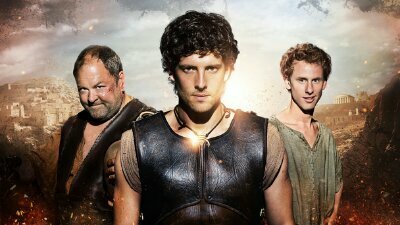 The first series launch attracted an audience of 8.4 million viewers, making Atlantis the biggest new Saturday night drama series launch across all channels since Robin Hood in 2006. The end of series one revealed that Paisphae was in fact Jason’s mother. The second series sees Pasiphae involved a dramatic shift of power in the kingdom. Pasiphae’s desire to reign has not abated and rivalry with step daughter Ariadne takes her to new depths. Jason’s personal involvement with Ariadne is surely a complication for Pasiphae, but will the knowledge that Jason is her flesh and blood weaken her resolve? Robert Pugh (Game Of Thrones, The White Queen) and Peter de Jersey (Broadchurch, Holby City) will guest star in the first episode of series 2. The series is created by Urban Myth Films for BBC One through BBC Cymru Wales and co-produced by BBC America. Johnny Capps and Julian Murphy executive produce for Urban Myth Films with Bethan Jones as executive producer for BBC. Atlantis will air on BBC One in the autumn.